While yesterday we had an army that had lots of models and units, then today the force featured in Armies of Australian Masters 2017 is a complete opposite. The Varangur commanded by Ken "Chaaarge!" contains only heavy cavalry regiments and a few but deadly associated heroes. Only eight elements in total and only four units! It is defnitely focused on charging and decimating the enemy, preferably during the first impact so that it can keep up the momentum and destroy unit by enemy unit. It has some ranged support too so that is not too easy to avoid the knights. 4 x 10 Mounted Sons of Korgaan - Horses are prized possessions and only a few herds roam the northern plains and tundra. Most clansmen that ride a horse have captured them in battle from raiding the lands to the south. The champions of the Sons make for fearsome heavy knights that ride the largest, most battle hardened of all northern horse herds. The thundering hooves from a charge by the Sons can be felt through the ground for miles around. Each regiment is capable of dealing the damage to the enemy either alone or in teams. 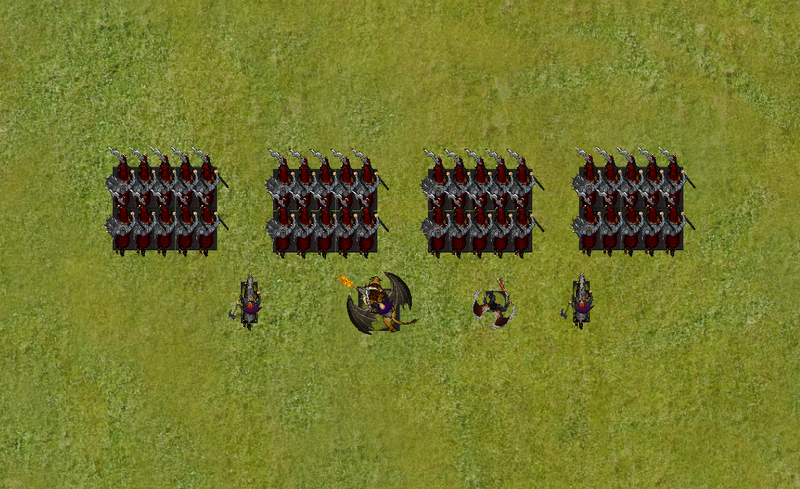 Although only one unit has Pathfinder upgrade, even if hindered and/or disordered, 20 Attacks with Crushing Strength (1) would leave the mark on any unit. And the enemy seems to be tough imagine what two or more regiments of this cavalry can do when charging together, even from the front. To ensure they are not slowed down by unlucky nerve tests they all come upgraded with Gift of Korgaan that grants them Headstrong and Fury abilities. King on Chimera - The mightiest of warriors, chieftains who have combined the might of multiple clans under their control through conquest and bloodshed will proclaim themselves a King. To prove their claim it is clan tradition that a king capture and tame a wild Chimera to ride in battle. The most powerful model in the army, the King is also very versatile element. He can patiently await the right moment to attack close and personally but at the same time would inspire his knights, possibly discourage enemy fliers to land behind the lines and inflict damage once in a while with breath attacks. 2 x Magus - The clan Magi are the voice of Korgaan, After proving themselves in battle, those with the gift of magic are transformed, their minds melding with their deity. They speak for Korgaan and dictate his wishes to the rest of the Varangur. Long range support of the army, they come equipped with two different spells each. Lightning Bolts will help to do damage at longer range and Fireballs are great against lightly armored targets. Although quite expensive they are not that easy to single out and with additional artifacts and Elite upgrades they are well equipped to maximize the damage output from their spells. Herja the Fallen - Herja was once the ruthless leader of the long dead Var’Kyr, the first followers of Korgaan from a time long since forgotten. During the ritual performed by the Sons, her remains were fused with the body and essence of Sor’ik’su, the bride of Ba’su’su and queen of his lofty serail. Captured during The Reckoning, her fierce will and resistance took an age to break and such power and resilience was an ideal match for Herja. Sor’ik’su’s spirit didn’t fracture and succumb completely and Herja was reborn as a true merging of two mighty individuals and with the potency and malevolence of both. Infamous Herja is a very interesting individual who sports Defense 6+ and in combination with the ability to fly makes her very dangerous interceptor. She is capable of defeating smaller units all by herself and even bigger enemies may have hard time to get rid of her. She is perfect for this army as she can quickly disrupt enemies and introduce confusion among their ranks. Let me know what do you think about this force? I always look at the army list as a function of the player's approach to the game and his skill. It is always important to assess strengths and weaknesses of the army but in the end it is the commander of the force who makes decisions. I hope I will have a chance to play against Ken again as we have already fought but then it was with a different, borrowed army. He often receives a similar comment so I would love to see what he does not to get slowed down by expendable troops.